Take advantage of the many tests and tools described in Evaluating Performance as part of your work getting the most out of Android. Cleaner separation between framework and vendor code. Deprecates the unnecessary healthd daemon. Greater degrees of freedom for vendor customization in health information reports. More device health information than just battery. Devices launching with Android 9 must provide the 2.0 HAL (and must not provide the 1.0 HAL). Devices not launching with Android 9 but planning to update the vendor image to Target Framework Compatibility Matrix Version 3 (released in Android 9) must remove existing 1.0 HAL implementations and provide the 2.0 HAL. AOSP includes multiple helper libraries designed to help you implement the 2.0 HAL and the transition from the old 1.0 HAL. health@1.0: abbreviation of android.hardware.health@1.0. Refers to health HIDL HAL version 1.0 released in Android 8.0.
health@2.0: abbreviation of android.hardware.health@2.0. 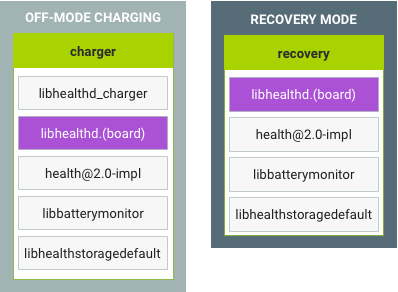 Refers to health HIDL HAL version 2.0 released in Android 9.
charger: executable running in off-mode charging that displays the phone-charging animation. recovery: executable running in recovery mode that must retrieve battery information. 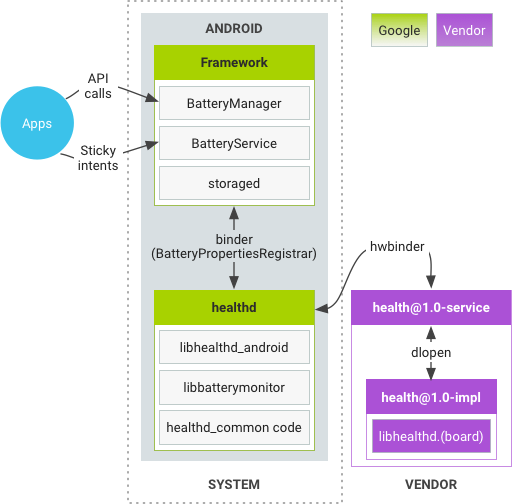 healthd: legacy daemon running in Android that retrieves health-related information and provides it to framework. storaged: daemon running in Android that retrieves storage information and provides it to framework. One (1) binder call and one (1) hwbinder call are used by the framework to communicate with hardware. healthd statically links to libhealthd_android, libbatterymonitor, and libbatteryservice. health@1.0-impl statically links to libhealthd.BOARD. 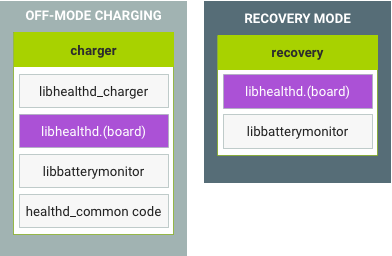 Each board can customize a different libhealthd.BOARD; it is determined at build time what charger, health@1.0-impl, and recovery link to. charger statically links to libhealthd.BOARD, libhealthd_charger and libbatterymonitor. recovery statically links to libhealthd.BOARD and libbatterymonitor. The framework attempts to retrieve health@2.0 service from hwservicemanager. If it fails, it calls into health@1.0 (in Android 8.x). The legacy code path is kept so the Android 9 system image is compatible with the Android 8.x vendor image. The framework does not retrieve information from both HALs because only one service version (1.0 or 2.0) can exist on the device. Note: For the legacy code path, the processes/libraries will be kept until health@1.0 is deprecated. 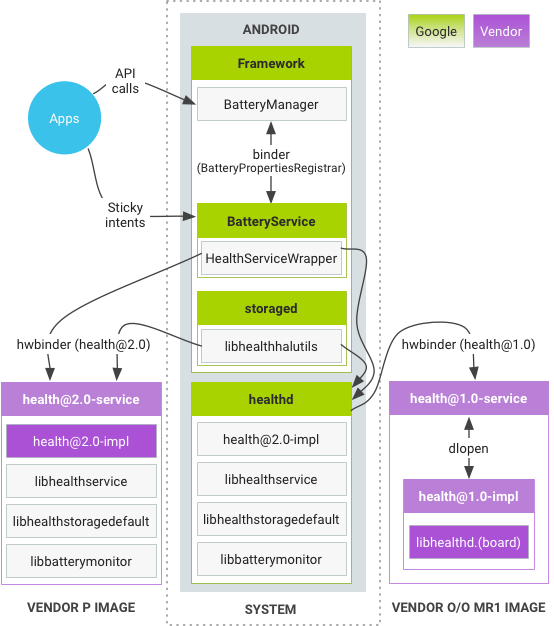 The health@2.0 HAL provides the same functionality to the framework as the old healthd daemon. It also provides APIs that are similar to what healthd previously provided as a binder service (i.e. IBatteryPropertiesRegistrar). For information on implementing the Health service, see Implementing Health.